I first came across Boris Tishchenko way back when W.H. Smiths in Newport went through a brief spell selling Supraphon LPs in their basement way back in the early 1980s. Shopping was still something of an adventure back then, and with prices I couldn’t refuse I learned a little about a lot of composers, many of whom remain in the deepest obscurity. It would seem Tishchenko’s star may have risen more than some, with his symphonies being given wider attention in certain quarters. This unusual piano release was reviewed as a download by Dan Morgan and welcomed as ‘thoroughly rewarding’, and I can't but agree. The Seventh Sonata is indeed unusual, with a significant part for bells – large bells, tubular bells and glockenspiel in a rising sequence between movements. These both challenge and unite with the piano as percussive and ringing entities whose characters also enter that of the music itself. Opening with those large bells, the first movement at times has massive block-chord repetitions with a bell-like character of their own, and there is at times a feel of Prokofiev-meets-Mosolov. This is energetic, creatively fervent music and a tour de force for the pianist. The shadow of Shostakovich is also not to be ignored, though Tishchenko’s voice is distinctive enough to have thrown off most layers beyond a spirit of Russian-ness which unites him with numerous musical forebears. The central Lento movement develops slowly but inexorably from sparse beginnings, the polyphony expanding from brief cells and repeated low notes into something truly rich and strange, at times channeling the spirits of Scriabin or late Liszt. The entry of the bells deep into the movement is a magical moment, and we hear the piano sonorities again with renewed appreciation for their resonant properties. Playfulness enters with the final Allegro, which opens somewhere between 1920s Paris and 1930s Moscow. Energetic power soon takes over, with driving rhythms that propel us into another more subtle terrain in which counterpoint and distinctive widely separated high/low range relationships are explored. It is again late in the movement that we are treated to the added sonorities of the glockenspiel, and that endless anticipation is part of what keeps us on our toes. That final music-box entry effectively punctures and deflates the ambitions of everything that has gone on before – a striking self-satire indeed. The Eighth Sonata also follows a three movement pattern but is a contrast to its predecessor. Frédérick Martin in his booklet notes suggests that “the juxtaposition of these two works becomes a perfect tribute to (Tishchenko), bearing in mind how deeply he respects tradition while at the same time tearing up its rulebook.” Approachability is indeed set against more demanding intellectual rigour, though even with all of this meaty substance I would challenge this composer’s meeting with the avant-garde as being in the ‘difficult’ camp. In both of these sonatas there are plenty of harmonic and rhythmic handles onto which we can hold while far-reaching territories are explored. The first movement of the Eighth Sonata throws in Romantic gestures and quasi-classical cadence at times, all the while creating a fascinatingly personal and often craggy music-scape. The second movement is an Andantino that also draws its musical threads around a recurring Messiaen-like resolution. Variations are developed in which an almost banal waltz-like bass motif plays its undercurrent of spooky wit, disarming the increasing intensity of the material above in a kind of bizarre musical puppetry that suffuses the whole movement. The final movement sets up a polyphonic, almost fugal proposition with its distinctive thematic entry, but expectations are undercut as ever, and the development is anything but conventional. Combinations of the tonal and quasi-Romantic are thrown together with musical gauntlets thrown down and picked up in elements such as an extrovert can-can, cat-on-the-keyboard effects and extraneous and almost unwelcome octaves. This is ‘fun’ but also unmistakably serious in a similar way as we know Schnittke to be serious. A stream of consciousness can so easily go off the rails, and Tishchenko’s sense of danger is always present. 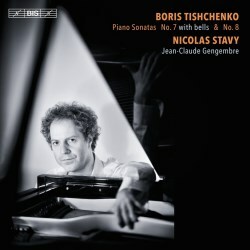 Boris Tishchenko is well represented on the Northern Flowers record label and the composer appears performing his Seventh Sonata in an impressive recording on NF9968. This is a remarkably powerful performance though the upper register of the piano de-tunes in front of your ears, and the BIS recording with Nicolas Stavy is equally monumental and a few degrees more polished. The Eighth Sonata is a little more elusive but has been recorded by Vladimir Polyakov as part of a 2 CD set on the Compozitor label. This I haven’t heard. Tishchenko’s idiom may take a little getting used-to, but the rewards are rich. This as ever is a demonstration quality production from BIS, and I also look forward to hearing much more from the remarkable Nicolas Stavy who already impressed us on the Hortus label with only his left-hand (review). Here we have both hands and more, and the results are stunning.